maNNulagIr – Oh residents of this earth! He is divining the enrichment of knowledge of the ignorant ones, about the greatness of srI kulasEkarap perumAL who divined his incarnation during mAsi (magha) punarpUsam (punarvasu). mAsip punarpUsam kANmin inRu maNNulagIr – As said in ‘mAsi munnAL (nAchchiyAr thirumozhi – 1.1), it can be considered as having greatness that is not present in any other day – that is mAsi (magha) month’s star day of punarpUsam (punarvasu), Oh see that those in this world – that day is today for you all! inRu – The one that occurred in the past and will in the future is appearing as today for him (maNavALa mAmunigaL) due to his regard/fondness. mAsip punarpUsam – It was in chiththirai month punarvasu star day that chakravarththy thirumagan (srI rAman) divined His incarnation. 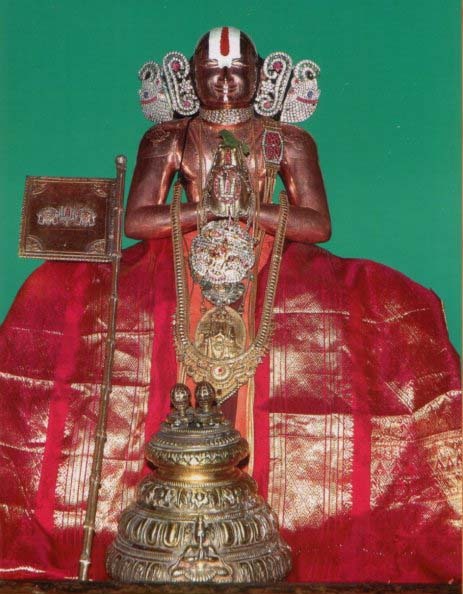 ‘ellai il seerth dhayarathan than maganAith thOnRiRRu adhu mudhalAth than ulagam pukkathIRA [perumAL thirumozhi 10.10]’ – (From His incarnation as a son of dhasarathan of limitless fame, till the time when He returned to paramapadham, that is, AzhvAr gave us the summary of srI rAmAyaNam), is how this AzhvAr lets us know about rAman’s glory; and his star day also has become the same. Like how those born in the lineage of kings should have a grand star day, this AzhvAr’s incarnation is having such connection with emperumAn. maN ulagIr – Oh the ones in this earth who are involved in the enjoyments of this world, and not paying attention to emperumAn and his devotees! Avoid your distractions and listen to the meanings I am talking about. Those in the other world are best in their true knowledge. Having less knowledge and as said in ‘uNdiyE udaiyE ugandhu [perumAL thirumozhi 3-4] going eagerly after food only, clothes only (and other comforts only) and being ‘mAranAr varivenchilaikku At cheydhu [perumAl thirumozhi 3-3]’ (Surrendering to the beautiful bad arrow of manmatha and enjoying this material world), — for such people as you only is it required for me to advise. pEsuginREn etc. – As he said about himself in ‘kolli kAvalan kUdal nAyakan kOzhik kOn kulasEkaran [perumAL thirumozhi 2.10] (king of the place of kolli, of madhurai, and uRaiyUr, that is kulasEkaran), such chEra king, is kulasEkara AzhvAr; the day got its significance due to his incarnation, and due to that (we) are able to get relation of the good; kulasEkaran’s birth is not of body but of life/AthmA – he said ‘UnERu selvaththu udal piRavi yAn vENdEn [perumAL thirumozhi 4-1] (I who has realized the good from the bad, would not want the birth in the body that grows rich in meat everyday, etc.). – are how his his likes and dislikes are set. Being amicable to be subservient (to emperumAn and his devotees) – that is a birth; this is as said in ‘Azhi am kaip pEr Ayarkku ALAm piRappu [periya thiruvanthAdhi – 79]’, and having ‘(un) viNNAttuth thEsu’ (regardless of the kind of birth in this world, if one has the devotion toward emperumAn, then such birth would be having the greatness/luster of your other [higher] world). In this way, due to this AzhvAr’s incarnation that is amicable to subservience, this day gets its luster. nallavargaL – they take care of others’ spiritual wellness like of their own. nAL – a day is one that is celebrated by such people. This day is nurtured and celebrated by those srIvaishNavas who have lost themselves to such quality of this AzhvAr and are good to his lotus feet. – Thus this AzhvAr wishes to be something, anything in the hills of thirumalai and with such wishes he serves emperumAn. 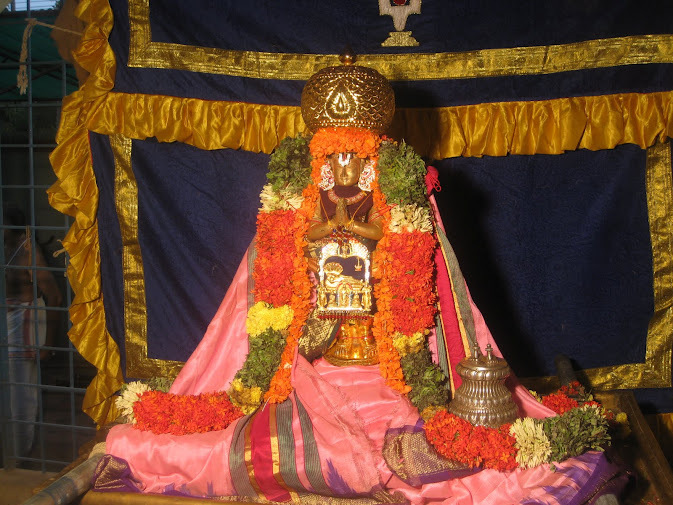 so, for this AchAryan also the punarpUsam (punarvasu) has become the star day of his incarnation. As said in ‘arasamarndhAn adi sUdum [perumAL thirumozhi 10.7]’ (falling at the feet of srI rAma pirAn who is seated with majesty in his throne), like this AzhvAr who seeks the feet of srI rAman, embAr too is like a shadow of rAmAnujar’s divine feet. In the case of distaste for other demi gods, he (embAr) matches thirumazhisai AzhvAr. embAr too is of two births in one (brAhmaNa). Due to all of these reasons, this pAsuram says about the greatness of this star day being of muppuri (three auspicious things happening in a similar way). This entry was posted in Other, upadhESa raththina mAlai and tagged 74, annan, azhvar, embar, erumbi, erumbiappa, jeeyar, jIyar, kovil, kulasekara, kulasekhara, lokam, madhura, madhuramangalam, maduramangalam, mamunigal, manavala, mangalam, pasurams, perumal, pillai, pillailokam, ramanujar, rathina, rathinamalai, raththina, raththinamalai, thirumozhi, upadesa, upadhesa on December 15, 2015 by raghuram.